My mother always said, “Don’t get married until you’re absolutely sure you’ve found the one.” I think this UK couple took that idea and ran with it because they got together 27 years ago and are just now tying the knot. While that may not sound like the most extraordinary thing, their ages makes it so. The bride and groom to be are 91 and 102 years old respectively. 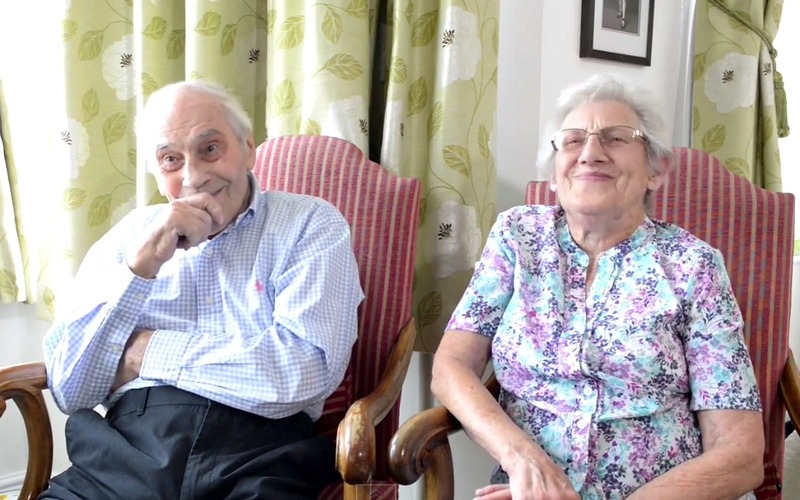 George Kirby and Doreen Luckie from Eastbourne, East Sussex, met back in 1988 through an organization designed to connect older people. Imagine an ’80s version of a dating site, only without the online component. At the time, Kirby was a spry 76-year-old who had just gotten divorced from his second wife, and was therefore ready to mingle. Luckie was a bit more hesitant as she had lost her husband of 36 years only three years prior, but there was something about Kirby that stuck with her. She told the Daily Mail, “He used to come to my house. We got on straight away. He liked the roses in my front garden.” And that was it. The couple shacked up three years later, and the rest, as they say, is history. Well, except for the fact that it took him another 25 years to actually seal the deal with a proposal. Just like any young groom-to-be, Kirby finally gave into pressure from his family to make his union with Luckie official. Kirby told the Daily Mail, “I suppose it’s about time, really. I definitely don’t feel my age. Doreen keeps me young.” While that may not sound altogether romantic, the actual proposal certainly was. Get ready to go “aw” repeatedly. Kirby proposed on this past Valentine’s Day over a romantic dinner. “We were having dinner and I asked Doreen if she wanted to be married to me for a short time. I was so happy that she said yes.” While I got stuck on the “for a short time” comment, it’s quite logical — he is, after all, 102. At such an advanced age, there’s no point in over-promising. However, his love for Luckie can’t be denied. “I didn’t get down on one knee because I don’t think I would have been able to get back up.” Seriously, this guy needs to get into stand-up, quick. They will be married on June 13 at the Langham Hotel, which Kirby’s son Neil owns. Neil, who’s 63, will be his dad’s best man. He and the rest of the family couldn’t be happier that the woman they already see as a mum will finally become so officially. “It’s about time my dad has finally made an honest woman out of her,” Neil told the Daily Mail. If you’re wondering how this couple can be as old as they are and still have so much life in them, their background may explain it. Kirby was a physical education instructor at RAF for 25 years, and was also a talented boxer who won all 60 of the fights he fought in his career. He continued to work and lift weights until he was 94 (seriously), but still remains active by working in Luckie’s garden. Needless to say, the man kept in decent shape his whole life. While Luckie spent most of her career as a typist — far more sedentary a life than her husband-to-be’s — she keeps fit by doing weekly yoga by the sea. The wedding itself will be small — only 60 guests will be in attendance — but Luckie is still getting that bridal feeling. “I won’t be much of a blushing bride, but I’m getting a bit giddy thinking about it.” The definition of cute needs to be updated with a picture of this lady. According to the Guinness World Records, they will be the oldest newlyweds in history, as their combined ages exceed the previous record holders’ ages by almost five years. However, the couple isn’t getting hitched for the record. Kirby said simply, “We’re not doing it for the record; we’re getting married because we’re in love and it seems like the right thing to do.” Now if you’ll excuse me, I’m going to go implode from cuteness overload.